DETROIT -- If Opening Day chill is a tradition in Detroit, then Friday was a classic. It's definitely something Tigers fans have learned to embrace. Compared with past openers, Friday's first-pitch temperature of 38 degrees wasn't nearly as rough. But compared with last weekend, when Detroiters basked in the warmth of 70-degree heat, fans had to be wondering where spring went. When the Tigers come home, spring can't be far behind. That's part of the reason why the home opener is an annual event, an automatic sellout crowd. A more obvious reason in Friday's case is that fans have been waiting six months for the Tigers to return, six months to get the sting of last season's tiebreaker loss and second-place finish. The 5-2 win doesn't completely do that, but it gets fans anticipating. It's a good ointment at the least. 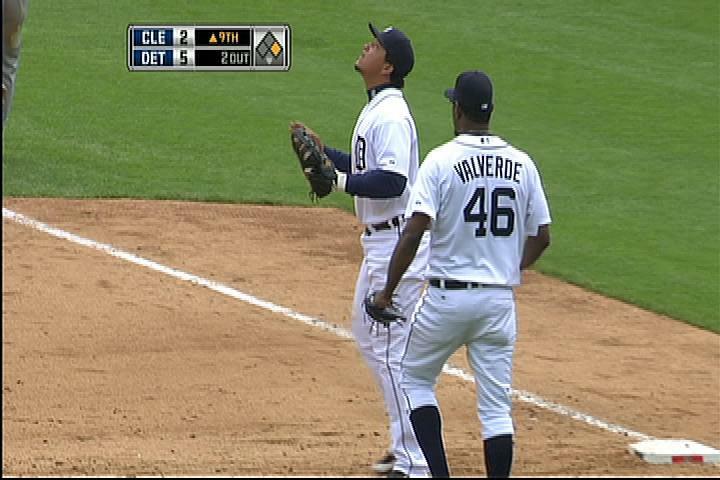 "We gave them a good show," manager Jim Leyland said, "and I imagine they're going home happy." An announced crowd of 45,010 -- the largest of any Tigers home opener at Comerica Park, and the second-largest of any crowd in park history -- took on the cold to watch the Tigers take on the Indians. If there was any question left whether most of them were ready to move on from last year, the loud reception -- given to Miguel Cabrera -- seemed to show a willingness to look ahead rather than peek back. Johnny Damon got a solid ovation after the seemingly endless free-agent flirtation over the winter raised questions among some fans whether Damon actually wanted to be in Detroit. They welcomed the two rookies in the everyday lineup -- Austin Jackson and Scott Sizemore -- and gave them memories of their first game in Detroit. Jackson came into the Tigers' clubhouse Friday morning and struggled to find out where his locker was located. With two runs scored, he found his place on the basepaths. As he heard the cheers from the dugout, and later from the third-base line during pregame introductions, he knew he had arrived in the big leagues. "Man, that's one of those things that you just dream about," Jackson said. "You go to a ballgame as a little kid and you're the kid out there cheering. And to have the fans cheering for you, that's a great feeling." Phil Coke had the honor of pitching in the last game at old Yankee Stadium and the first game in the new version. He compared his feelings Friday to those events. "For me, I'm just going out there to do my job, and sometimes I've gotten a lttle more amped than I want to," Coke said. "You can't exactly help that." Few know that home-crowd adrenaline in Detroit better than fellow reliever Joel Zumaya, who also knows the cold of Michigan springs all too well. "The fans are out there in 38 degrees," Zumaya said. "They're out there to support us. We want to give them all we've got." Before the Tigers took the field, they had pregame ceremonies with their usual distinctive local flavor while also saluting area military members. Joyce M. Lambton, Yeoman Second Class of the U.S. Coast Guard, joined Marine Corps Captain Thomas Shield, U.S. Army Sergeant 1st Class Bradford Webster, U.S. Air Force Technical Sergeant John Self and U.S. Navy Aviation Electronics Technician 2nd Class Petty Officer Ryan Kempf to throw out ceremonial first pitches. Tim Allen, Michigan-raised star of television and film, presented them with the baseballs. Zumaya and teammates Adam Everett, Alex Avila, Ryan Raburn and Don Kelly stepped behind home plate to catch the first pitches. A military flyover featured four F-15C Aircraft from the 95th Fighter Squadron of Tyndall Air Force Base. Following the traditional team introductions, Master Sergeant Derek Stancle of the United States Air Force delivered the game ball for Tigers right-hander Rick Porcello to use for the official first pitch. I'm pretty sure it was 3 F-15s. Matt Giraud sang the National Anthem wonderfully. And I don't think any fans minded the 38 degrees. Goooo Tigers!